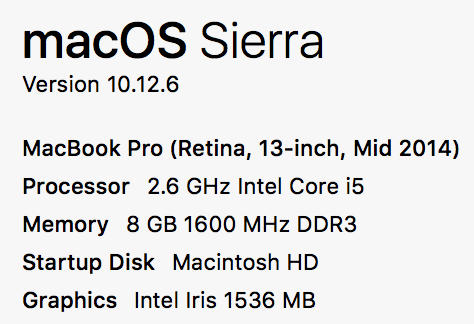 I have a MacBook Pro (Retina, 13-inch, Mid 2014) and would like to upgrade my SSD. I've searched online and haven't been able to find which type of SSD would work for this particular model. I've included the specs below. Is an SSD upgrade compatible with my computer, and if so, what type? The specs for your Mac can be found at everyman.com. Navigating the various link leads to this website for possible SSD upgrades available for your Mac. Other links lead to this installation video website. Not the answer you're looking for? Browse other questions tagged macbook mac lion ssd upgrade . Upgrading SSD on mid 2014 MB: which SSD?